Campania is renowned around the world for its exuberant food which is full of sun: vegetables and herbs, salty capers, dried pasta, and fresh farmhouse cheeses like the great buffalo’s Mozzarella (Mozzarella di bufala). An outstanding gourmet’s favourites mozzarella cheese, the Mozzarella di Bufala coming from this region is totally famous and a fab choice to add to your great dishes. The fertile soil around the Vesuvius and a wealthy fishing industry make Campania one of the most flavoursome and interesting cuisine in the whole Italian Peninsula. The seafood dishes are tasty while the pastries comes from the Far East: Greek and Arabic influence and heritage show off in some dishes that often contain honey, nuts, and a lot of different spices. Another great Campanian dish is melanzane alla parmigiana: a multitude of fried slices of aubergine gratineed with tomato sauce, mozzarella and parmesan cheese!!! During the nineteenth century, all the people in the city of Naples were nicknamed as “Mangia Spaghetti” (Spaghetti Eaters). Naples in particular is famous for its pasta dishes: here spaghetti is served along with sugo di pomodoro, a tomato sauce. Neapolitans still remain attached to this tradition of pasta-addicts, also because their pasta is home-made and it is the most various and best quality pasta in Italy. 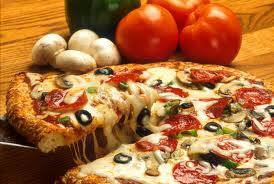 But Naples is the undeniable home of the most famous Italian dishes: the ‘pizza’ . Everyone knows that and during a trip in Naples, you can’t avoid eating it!!! The Pizza Margherita is particulary famous: this variety of pizza was created and named after Queen Margherita, when the royal family visited the city. This delicious and tasty dish is made with a lot of mozzarella cheese, tomatoes and basil: each ingredients represents indeed the red, white, and green of the Italian flag. This entry was posted on Tuesday, November 8th, 2011 at 5:04 pm	and is filed under Italian Recipes and Food. You can follow any responses to this entry through the RSS 2.0 feed. You can leave a response, or trackback from your own site.